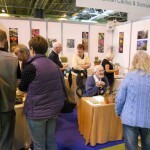 Last day at the NEC today – and some good news. 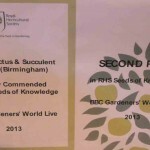 The branch was awarded a second prize for our stand at Gardeners’ World in the Seeds of Knowledge section. 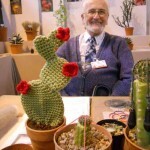 Note the much talked-about and lovely knitted opuntia – and don’t forget there is a branch meeting coming up this Tuesday: a plant sale.